Some may say that I look like a mob wife in this ensemble, but I am absolutely mad faux it! Get it? Puns aside, I am excited to reveal this whole look here on the blog. 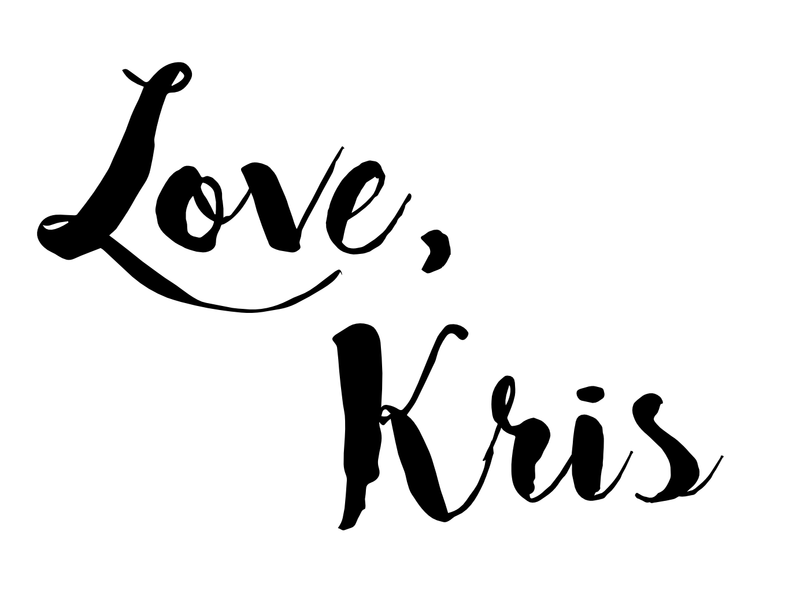 I know I showed a few sneak peeks on my Instagram, but here's the whole shebang! 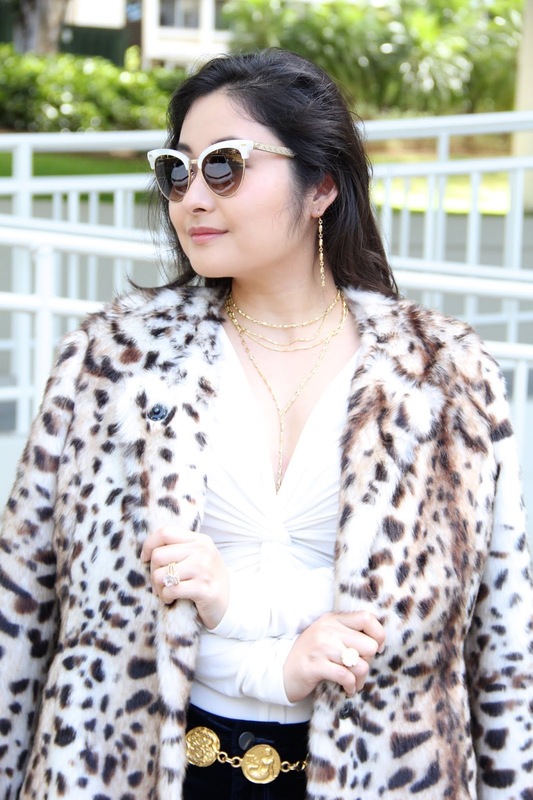 As a fashionista whose personality is tamer than her style, it came as no surprise that I was drawn to this statement faux fur leopard print coat. I purchased it a few years ago, worn it a few times, then squished it back into my closet. On the rare days that I did wear this coat, I styled it with a pair of black jeans and a white tee, so I never thought that look made the final cut to be "blog-worthy." 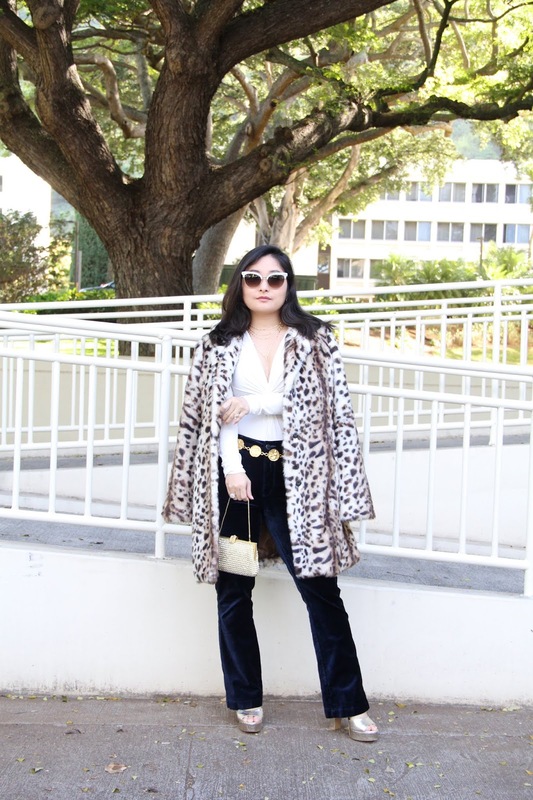 Well, for this outfit post, I stepped up my game and spiced this coat up with a bit of blue velvet, gold accessories, and a touch of vintage vibes. 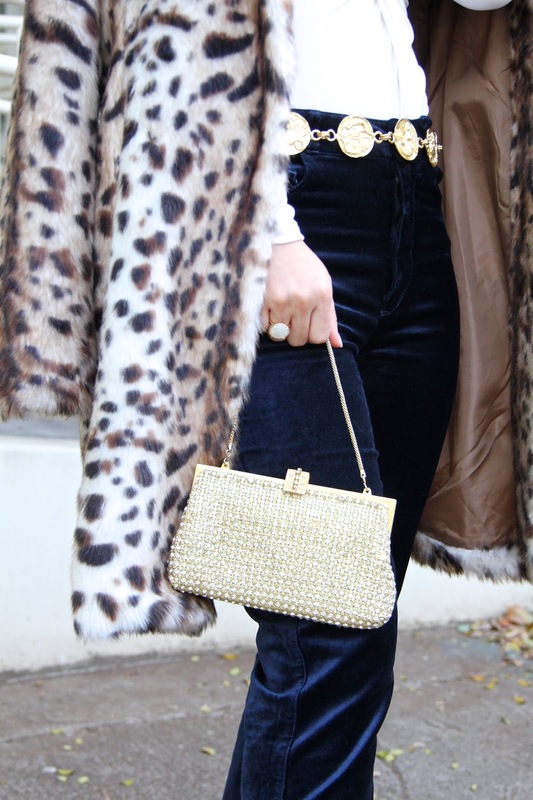 The first antique piece in this outfit is this gold astrology chain belt that I also wore in my previous outfit post, That 70's Outfit. I love the way it contrasts with the deep royal blue pants and how the velvet sheen mimics the brilliance of the gold. If you thought the first vintage piece was a show-stopper, this one will blow your mind. My mother gave me this rhinestone-encrusted clutch to play dress-up with as a child, and it was my absolute favorite. 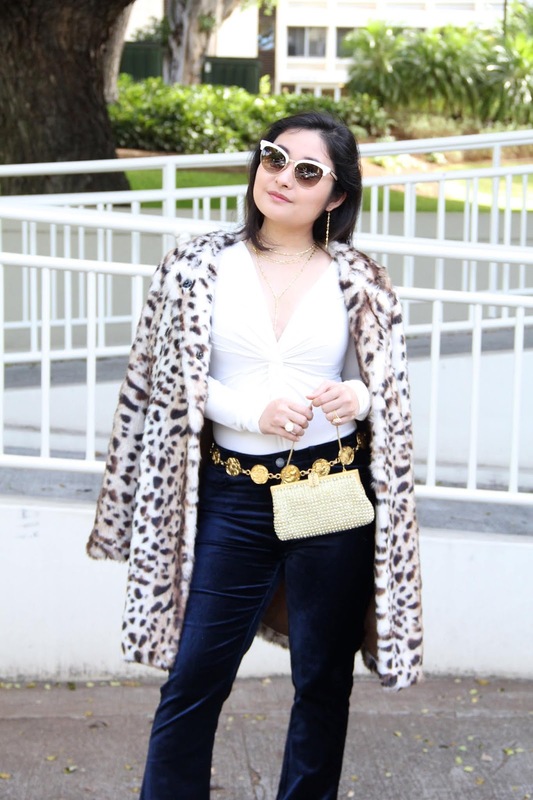 She wore this purse to her senior prom with a flowy pink dress, but I decided to style it with a pair of pants and a boss babe faux leopard coat. Its versatility and style stand the test of time and the ever-changing cycle of trends. Classic never goes out of style. Now, on to jewelry! It's sparkle time! Since the coat and belt make a statement all on their own, I tamed the jewelry selection and decided on delicate gold necklaces. The simplicity of their design adds the perfect amount of brilliance while keeping the bolder pieces in the spotlight. For earrings, I went with a pair of dainty drop chain baubles, and a couple of gold rings. Like icing on a cake, every outfit needs a pair of sunglasses, so I chose my favorite pair of Gucci sunnies to pull the whole look together. And that's all! Personally, this outfit isn't one for running errands in, but it sure is fabulous! Maybe I'll wear it for a business meeting or for a day out with the girls? Whatever it may be, I will definitely find an excuse to wear this look. Well, I hope you enjoyed reading this outfit post! Until the next one, I am sending you lots of love from my heart to yours!